Who wants to read a story where society has broken down, things have changed for the worse, and civilization is a thing of the past? Well, a lot of people. One of the most popular genres right now is dystopian. What exactly is dystopian literature? When it comes to books, no two are exactly the same, but dystopians are stories that explore social and political structures, especially the breakdown of these structures. What happens if society as we know it becomes a living nightmare? You get a suspenseful story with strong conflict. · Dystopias automatically put characters in a “high-stakes” conflict, often concerning their ultimate survival or demise. · It questions authority, values, humanity--often the rites of passage for adolescence. · It is the hero’s (or heroine’s) journey, but through a world familiar and fantastic, often dangerous. It’s a story that stretches the imagination, but it is based in reality. · It is often a cautionary tale and provokes thought about the possible consequences of an irresponsible society and/or government. · Dystopias can be an outlet for anxiety of the unknown. When the economy is bad, when wars drag on, when life seems unpredictable, fiction can generate optimism for a better tomorrow. · Of course, ultimately, dystopian literature is about hope. The hero must overcome seemingly impossible circumstances, but in the end, he or she can make a difference in a ruined world. Wouldn’t we all like to achieve that? 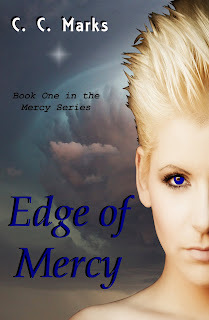 Edge of Mercy, my debut novel, is a young adult dystopian paranormal with a smidgen of romance. It started as a flash fiction piece that got great reviews, except for one flaw--it was too short. So, I lengthened it, and it will release on Tuesday, July 31st, 2012. Hope you’ll take a look and see what all the fuss is about dystopian stories. My life wasn’t a freaking animated fairy tale like the ones in movies or on television long ago. I knew that very well, thank you very much. Movies and television were gone now. No more radio, no more Internet, no more tests of the emergency broadcast system. All gone, and we were back to basics, back to primal earth in a never-ending game of predator versus prey, and we were no longer the predators. Trust me, it was no fun being the prey. In the community, I’d had bad days. I’d had days where I questioned if I really had an advantage inside the protected walls. But tonight took it to an extreme level. Night in the compound terrified me, what with sure death constantly clawing to get inside. Yet, this night eclipsed them all. I covered my ears, gritted my teeth, a bubbled scream trapped in my chest. A tight hold on my emotions kept my fear from popping free in a loud, long wail. But just barely. Others around me didn’t possess my level of control, especially Zeke, who sat beside me. His breaths came labored and loud to my ears. Part of me itched to reach a hand out, to reassure him that this night would pass like the ones before with all still safe inside, the sun rising on a new day. But I didn’t currently do girly, and I was no longer Charlotte Baker. Here, I was Charlie Little, the boy the community took in, along with a baby sister and a dying mother, a little over six months ago. If they ever thought differently, I wouldn’t last the night. Screeches and clangs bombarded the combination wood and chain link metal fence surrounding the brick structure. We cowered in windowless cells inside. My hands firmly planted over the sides of my head, I couldn’t make myself pull them free. Sure, our security protected us well. The fence was electric and the building reinforced from the inside, but tonight, something was different. The creatures never attacked with this much intensity, and a wish to crawl into the deepest, darkest hole and hide there until it all ended crept over me. Zeke’s muffled voice penetrated my flimsy hand armor, and I shifted my gaze to meet his. His dark-brown eyes were wide and expectant. Right? I hadn’t heard a question, wasn’t sure I could focus on anything he wanted to know now. My response--a shake of my head. “I don’t know, Zeke. Is it?” The panic in my voice remained buried by the jarring crashes outside. Like last winter. Last winter, I came face-to-face with a draghoul. Then I fought through a horde of them to get here. My fear wasn’t from ignorance. I’d seen them up close, and they were beyond frightening. Their exteriors weren’t that much different from when they were once human. And they were once human, as unbelievable as it was. But the transformation into a monster was permanent and dreadful. The pale sallow skin, the glazed, souless eyes, the malicious teeth were a vision I would never forget. The fact they used to be people we knew, some we loved, made the sight of them all the more devastating. An explosive bang vibrated the walls and I jumped. God, I hated the night. It was too real, a reminder that humans no longer ruled the planet, a reminder that we were no longer the dominant species. My hands shook, and I lowered and squeezed them between my thighs to keep them out of sight. I chanced a look in Thomas’s direction and felt more than saw his intense dark-eyed gaze burn into me. So often, he just stared, and questions lingered behind his intelligent eyes. Sometimes I wondered if he knew or at least suspected the truth. Life could always get worse for Star and me if he worked out my real identity. We wouldn’t survive in the forest again, and we had nowhere else to go. Thanks for stopping by, and I hope you’ll check out Edge of Mercy, on July 31st. 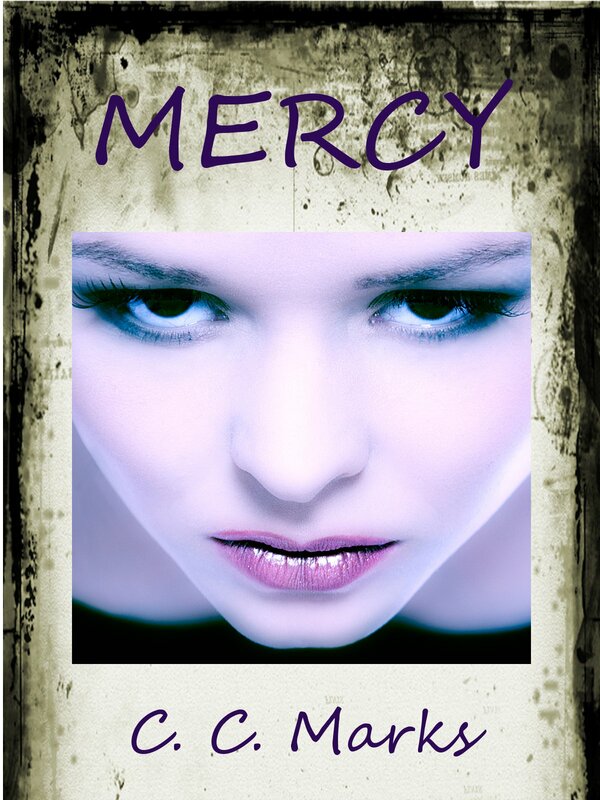 If you just can’t wait that long, you can get an exclusive sneak peek with my short, “Mercy,” which is available now at Amazon and Smashwords. Thank you for having me on your blog today, Pam. this book sounds pretty cool :) and like a twist on the dystopians I've not read yet. okay, that didn't completely make sense. I mean it sounds like you've put an original twist on the dystopian novel. The excerpt had me on the edge of my seat. Definitely gotta check it out, Cherie! Thanks, Carla. This was one of those I just had to write. Loved it from the start, and I'm still excited about it. Yay, Taryn! Thanks for stopping by. Glad to hear it hooked you. Great excerpt, Cherie! I can't wait to read it and find the answers to all the questions already in my mind. Let us know when it's out with B&N so I can download my copy. Congrats! I agree it's about hope; but I also think that it's a way to deal with the frightening possibility of nuclear or other mass weapons that are a real threat to us. Excellent excerpt. I love this kind of book. I know I'll have to read it. And I loved the cover!!! Awesome to see you here, new mama! I can't wait to share this read. It's one of my faves. No doubt about it. To me the dystopian genre is about the possibilities we've created for our own destruction, and how we might face a future where the horrible does happen but somehow the human race goes on, ever hopeful for a better day. All in all, it's a three book series, so I will definitely keep them coming. Teresa, thank you. I really like the urgency of the cover, if that makes sense. Almost like I want to shout at her to turn around and look behind her. So glad you stopped by. I think it's true that it is about HOPE and the desire for GOOD and, importantly, the desire to be able to express our individuality. I think it's about the desire to be able to express our individuality and also like a risk management strategy - pointing out the icebergs before we hit them. management. Thanks for stopping by. How cool that I might have clarified something for you. Most people are familiar with The Hunger Games. Others that are dystopian--A Wrinkle in Time, The Giver, Fahrenheit 451. It's a great genre. Congrats, Cherie! I loved your first book :) Can't wait to read this series. Thank you! You've been a great role model and friend. I love, love, love your books, and it's a real compliment to hear you say you liked mine. Your book sounds great, Cherie. I can't wait to read it. All the best with it and the rest of the series. Thank you, Barb. I don't know how anyone writes without the support and motivation a writing group (or various writing groups) gives. You and the other angels are such an important part of my journey. Thank you for stopping by. Again, thank you, Pam for the opportunity to hang out here today. Thanks to everyone who stopped by. This has been one of the most enjoyable guest blogs I've done. Have a great night, everyone. Sorry I'm late Cherie, but that seems to be my thing. This story sounds truly terrifying...I was all tensed up, just reading about it! Great job putting the reader right there with you. Think I want to wait for the whole thing to come out...don't want anything to ruin my reading pleasure.